Situated in the heart of Westminster, near to the Houses of Parliament, the AGM venue offers easy access to public transportation. WIth 19 different rooms within the AGM venue, event organisers can choose from a variety of small, medium and large event rooms. The largest room, the dome-shaped Assembly Hall, accommodates up to 600 guests in a theatre-style conference. The AGM venue holds a SIlver Green Tourism award as formal recognition of its ongoing efforts to minimise the Westminster venue's impact on the environment. From working lunches to afternoon teas and hot and cold buffets, we offer a wide variety of food options to treat your guests. A huge thank you to all the Church House team for your incredible efficiency and smooth-running of yesterday's event. Your team was incredible and so accommodating, honestly, the best event management I have encountered, so thank you very much. Situated in the heart of London and within walking distance from Westminster Abbey and The Houses of Parliament, the AGM venue provides excellent transport links, via both St James’s Park and Westminster tube station and Waterloo and Victoria mainline stations. The AGM venue is set within Dean`s Yard and provides a peaceful and green setting along with stunning views of Westminster Abbey. The central AGM venue offers up to nineteen flexible rooms, the largest of which, the Assembly Hall, which has a theatre style capacity of 600. The Assembly Hall is dome-shaped and has an impressive domed roof and oak panelling. Designed by world-renowned architect Sir Herbert Baker in 1939, the Grade II Assembly Hall's focal point is a striking 30-foot glass dome. The room is split over two levels, with a capacity of 468 on the lower level and 132 in the upper gallery, which runs around the whole room. On the gallery level, there are 15 arched windows providing plenty of natural daylight, which can easily be darkened, if required. Other event spaces within the AGM venue include the Harvey Goodwin Suite on the ground floor, which is often used for smaller annual general meetings and conferences. The event space seats up to 180 delegates in a theatre-style or 96 in a cabaret layout with 12 tables of 8 delegates each. All events within our AGM venue are supported by our in-house team of Audio-Visual team experts and technicians. Since Church House Westminster first opened in 1990 it has often been hired as a special events venue, notably, the Assembly Hall, having hosted fashion shows for London Fashion Week, political hustings and debates, concerts, filming and on-trade wine tastings. 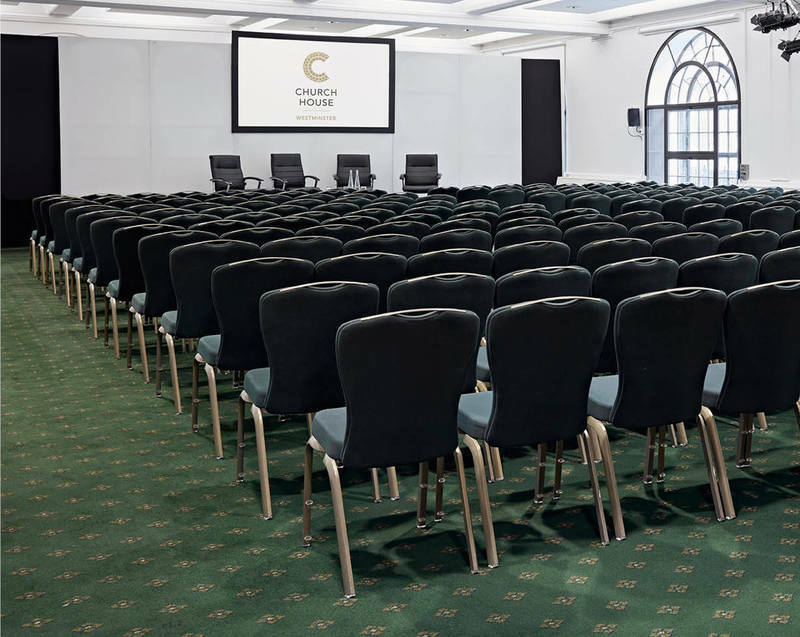 Church House Westminster is also a popular Christmas party venue, award ceremony venue, conference and meeting venue, and evening reception and dinner venue. Contact us to find about more our AGM venue in Central London by calling us on 020 7390 1590 or fill in our contact form.